We can have the best SEO in the world, but if we don’t have a plan in place once visitors reach our website, all that effort into SEO and search is useless. How do we convert those visitors into leads? 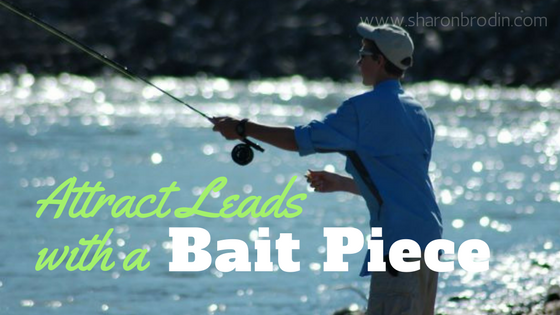 By attracting them with a bait piece (also known as a lead magnet). My husband and two sons are avid fishermen. For years I’ve been hearing about leeches, minnows, Rapalas, spinners, rooster tails, and Swedish Pimples (yes, a real bait!). I’ve even put some of these on the fishing line and casted myself. I don’t know a lot, but I know this—you choose your bait based on the fish you’re after. And your bait needs to be tempting enough for them to bite on. The same is true for your website. You don’t want your visitors showing up, looking around and “swimming away,” never to return. We’ve been fishing in the spring when the sunnies are so active they’ll bite on a bare hook. But usually we need bait to catch the attention of the fish. Likewise, you want something on your website to catch the eye of your target visitors. Something that’ll keep them on your site longer. Something that’ll give them a reason to remember you. How do you know you’ve got the right bait? You have to know your fish. If you’re after a walleye dinner, you use bait walleyes love—like leeches. bait? What problem do they have that you can help them solve? What can you offer of value to them? What questions can you answer for them? The answer is great content that offers information, how-to’s, inspiration, education—even entertainment. Blog posts, podcast or videos are perfect vehicles. Even better is a bait piece (also known as lead magnet). A free item—preferably a downloadable item—your target audience sees as valuable, and would love to have: a chart, a checklist, a guide, e-book, audio or video file. There are lots of possibilities. Once a fish has seen your bait and bitten, you want to reel it in. When those in your target market visit your website, you want them not only biting the bait, but coming into the boat. Your bait piece gets their attention and hopefully a bite. Asking them to fill out a sign-up form to get the bait piece is like reeling them in. It’s a trade-off. They get your valuable bait piece. You get their name and email address. Now you have them on your all-important in-house email list. This means you can stay in touch with those you already know are interested. Follow up regularly, and when they’re ready to buy your business has stayed top-of-mind. So having ways to attract, hook and reel in those visitors who are looking for a business like yours is invaluable. It makes full use of your SEO. It’s the first step in building your in-house email list of prospects. Not sure how to get visitors to your website in the first place?